After a couple-three months of not writing/posting here, I decided that my weblog is still something I want to do. Since my last post (back in February), I have been plenty busy with work and other things. I have enough work to pay my bills. For that, I am truly thankful and give God the glory for his provision. I have more than I need and most of what I want. I spend some time every day outside with The Girl. It is a good life and I am grateful. In addition to opening up space for my iMac, I was able to move the PC workstation from the floor to the top of the original six-foot worktable and move the monitors to the left. That left me space to center the keyboard. I also moved my B+W MM-1 speakers to the PC so that I can video conference from the PC workstation while sharing the screen with results. So, with a break from work and travel, I elected to rework my home office. I found myself cramped with a 27-inch iMac and a new PC workstation with a pair of 28-inch Samsung 4K monitors. So Saturday I tore down the iMac, the PC workstation, and the peripheral support and set them all aside. I turned over the existing six-foot and fastened 1/2-inch cable clamps to the underside of the table and set screws to hold one of the surge protectors. I righted the worktable and moved everything to it and removed the other worktable, a five-foot unit I was using for the base of an L-shaped. I then retrieved my other six-foot worktable from the garage and cleaned it up. I turned it over and mounted four more 1/2-inch cable clamps to the bottom and screws to mount two surge protectors. With that task done, I righted the table and set it next to the other. The reorganization of my workspace includes exchanging the five-foot worktable with a six-footer. 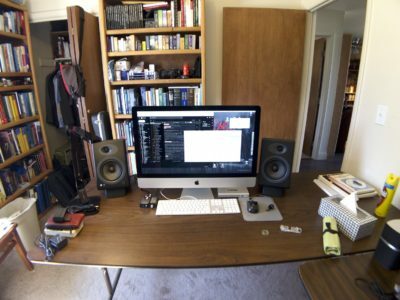 The iMac was moved from the adjacent six-foot worktable, opening up the workspace, providing me space to write (yes, handwrite, with a fountain pen), and work on small projects. I also added the Audioengine A5+ speakers and a 24-bit DAC to the workstation. The hard work of lying on my back and wiring everything commenced. It took me an hour to route all the cables to their respective locations. I used cable ties to tie the cables to the clamps on the underside of each table. This keeps the cable mess under control and off the floor. I like having no cables on the floor for two reasons: 1) It makes keeping the floor much easier and 2) The Girl cannot get caught up in the cables and cause a disaster. She loves to curl up under that table when I am working and often walks under the table that sticks out from the wall to interact with me. 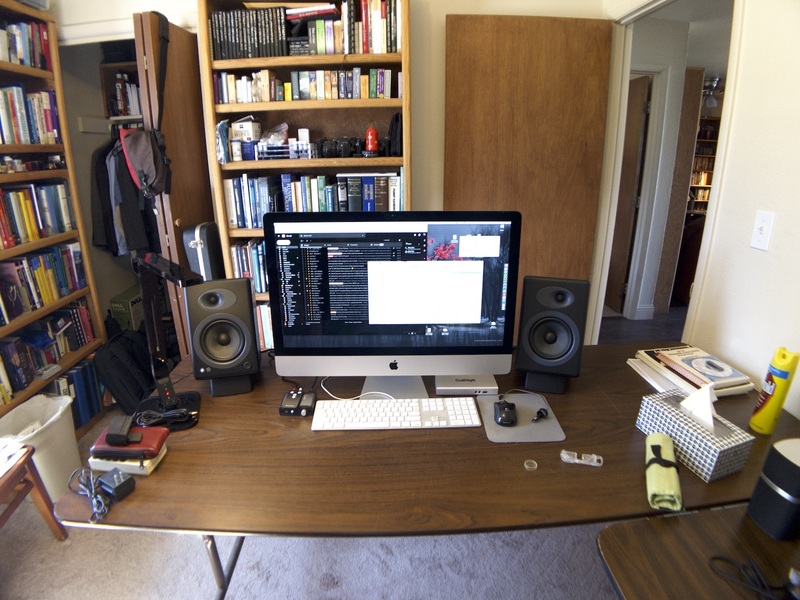 I added a set of Audioengine A5+ powered speakers to my iMac. I listen to music (a lot) and prefer speakers when working. I have not found a set of wireless headphones that do not have dropouts. (The exception is my Steelseries Arctis gaming headphones, but they are not really for music.) There was nothing wrong with the B+W MM-1s that I have. But I also want a set of speakers for my PC workstation because I use it for video conferencing through Skype and Google Hangouts with clients and colleagues. I do not want to use a headset for that interaction, so the B+Ws went to the PC and the Audioengine speakers are being given a workout on the iMac. They are BIG, probably eight times the volume of the MM-1s. The larger drivers and increased volume of the cabinets makes a difference — a BIG difference. I am on my 30-day audition of the new speakers and will give them a real workout over the month. However, my initial impression is very good. So, that is a summary of what I am up to. I have more images to post and more stories to tell. You have been busy Dave! Yep, Sis, I have been busy. You should have seen the mess before I got started. It was on my list for a long time, but I was busy enough that I just didn’t have the energy to start the project. 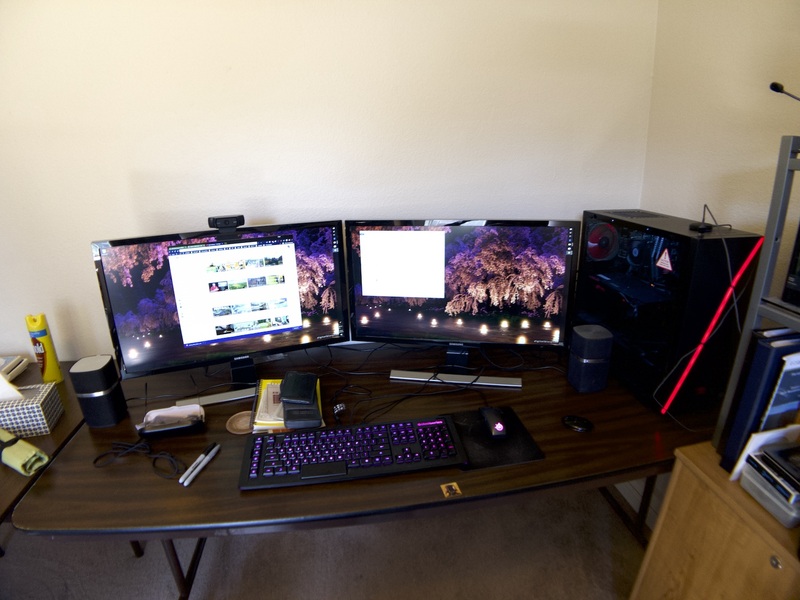 But I had everything assembled and the new speakers were coming, so I decided to dig in yesterday and get it done. It took me all day to do it. But it was totally worth it. And the new speakers… they are sounding wonderful.